The eerie, obsessive attraction between a restless woman and a dangerous traveler tips into madness. 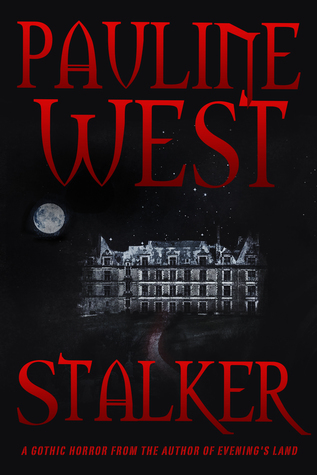 Terror with a twist, STALKER is a richly gothic tale to be read by candlelight. This book has been sat on my TBR for far too long, so here’s my humble and formal apology to the author for keeping her hanging and myself for denying myself this slice of excellence! Holy shitballs, this book was good. I like a novella at the best of times because the author has to fit all the good stuff into a limited number of pages so they tend to be very direct, which is something I enjoy. The suspense and build up in this book are amazing, tension you can cut with a knife but with the occasional joke or phrase that had me laughing at the down to earth reality. West’s writing style is pure gothic poetry, which is why this novella gets 5 stars and I started reading her next one the second I finished this. It’s movie night on Three Bear Road… but your best friend is a budding psycho and your parents have been possessed by demons. This author has me in the perfect Halloween mood now, this book is as tense and well written as Stalker – only this time we’re seeing the world through the eyes of a 9 year old girl who’s convinced her parents have been possessed by demons. This novella was creepy and atmospheric, which is its greatest appeal for me – you couldn’t guess how the story was going go, right up to the end. It takes advantage of childhood nostalgia, but in such a way that it doesn’t really matter what generation you’re from so readers of any age can connect with the characters and their surroundings – meaning we can all be creeped out equally. This story was the perfect length, I could happily sit and read a collection of West’s work in one go to get me in the spooky spirit.